When significant flooding strikes one of our interior communities, Tanana Chiefs Conference can step forward to provide supplies and support during times of need, even before government and other organizations can, by coordinating with both state and federal agencies. TCC has always been willing to assist our tribes during disaster situations. However, it is important that you are prepared before flooding happens. 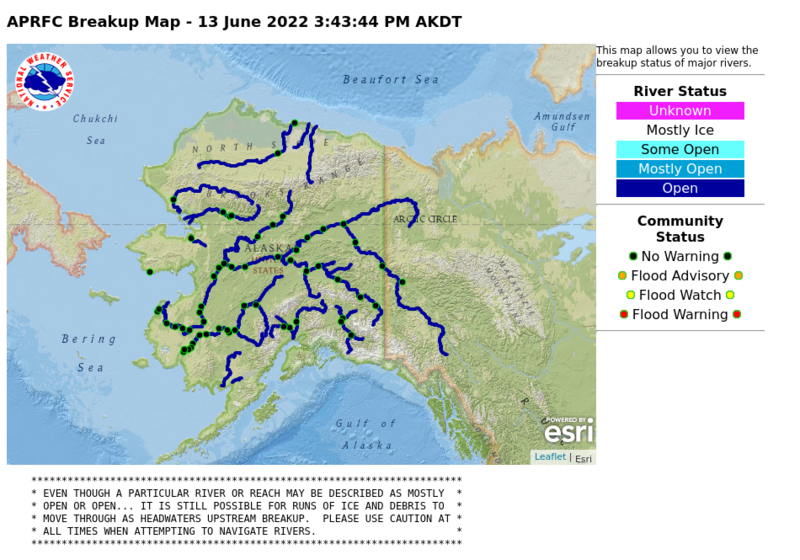 The map below provides a breakup status on the rivers. This is a helpful tool to understand what the flood risk is in your community on a day-to-day basis. For more information and to use the interactive map, click here. This groundwork can go a long way in avoiding damage and decreasing stress during breakup flooding. TCC’s Office of Environmental Health (OEH) is ready to support TCC villages with their environmental health concerns before and after flooding. This will need to be secured in the event of a flood. Secure fuel tanks, small fuel containers and barrels to keep them from floating away. Emergency Kits are important to have in the event you need to evacuate. Find out your community’s flood plan. Ask your Tribal or City Administrator about the community flood preparations and if the community’s emergency response plan has been updated. This may include a local area to evacuate to, designated people to observe the river level and alert the community. Remember food, water and medications! Find a link HERE for a kit guide. Remind others to plan for potential flooding, and help if needed. Identify emergency response equipment in the village (boats, flotation devices, and maintenance and rescue tools). Get essential facilities ready(clinic, water treatment plant, electric utility, records storage with the City and/or Tribe, etc.) for possible flooding. Help identify “at risk” residents of the community. These are the people that need to be evacuated before flooding for medical reasons. Identify elders or other people that may need assistance during a flood and help to make sure they are prepared. Remember their medications. Flood proof the essential facilities and other public buildings. Move all dry goods and canned food items above the high water level in your home. If you have any questions about flood preparedness, you can contact TCC’s Office of Environmental Health.